It’s All About the Hijra. The process of settlement is a “Civilization-Jihadist Process” with all the word means. The Ikhwan must understand that their work in America is a kind of grand Jihad in eliminating and destroying the Western civilization from within and “sabotaging” its miserable house by their hands and the hands of the believers so that it is eliminated and God’s religion is made victorious over all other religions. Without this level of understanding, we are not up to this challenge and have not prepared ourselves for Jihad yet. It is a Muslim’s destiny to perform Jihad and work wherever he is and wherever he lands until the final hour comes, and there is no escape from that destiny except for those who chose to slack. But, would the slackers and the Mujahedeen be equal. This is an excerpt of a document titled An Explanatory Memorandum On the General Strategic Goal for the Group In North America. 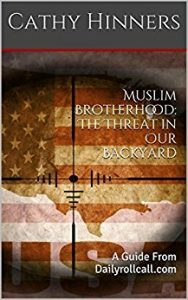 Written by Muslim Brotherhood member Mohammed Akram and approved by a shura (legal) council in 1991, it is the stated goal, and method of achievement for the infiltration of the Muslim Brotherhood in America, which was not intended to be made public. This document was found among 80 boxes of papers, hidden in a sub-basement of Ismail Elbarasse during an FBI raid of his Annadale VA. home after he was arrested on a warrant in connection with fundraising for Hamas. This document was entered as prosecutorial evidence in the federal case known as the Holy Land Foundation trial, held in Dallas Texas in 2008. Muslims in America hate when excerpts of this document appear. So much so, groups like the Council on American Islamic Relations (CAIR) have tried to discredit it, but CAIR and several members are actually named in the document,which outlines their involvement. Today,more than ever, this document is of great importance as it reveals the real reason behind why a suspension on Muslim refugees has caused a massive, false outrage. The lies of Muslim families being torn apart, Muslim internment camps and Muslims being murdered on American streets are being fueled by those who want to fundamentally and drastically change the demographics of the United States. In order for America to be completely transformed, there must be a large population of Muslims to give them an advantage, hence the Hijra, or migration of Muslims to non-Muslim countries. A temporary pause of Muslims from entering the United States interrupts the advancement of this plan. However, It needs to be understood the Hijra is a religious obligation that every Muslim must perform. That is why the outrage has boiled over to religious leaders of all faiths speaking out against this “ban”. What they believe they are witnessing is religious persecution, when in fact the Hijra will eventually be the persecution of all other religions, as Islam must dominate. All one has to do is look at what is occurring in Europe to comprehend what large masses of Muslims are capable of doing. A mission as significant and as huge as the settlement mission needs magnificent and exhausting efforts. Another excerpt from the Explanatory Memorandum On the General Strategic Goal for the Group In North America simply means Muslims cannot work alone. The importance of unity, to co-exist and work with others for the sake of Islam, especially with non believers to gain trust and cooperation as to not be seen as an enemy. Anyone paying attention can see how Muslims have created and embellished false “hate” crimes which enables them to portray themselves as victims. This has given them the protection, support and sympathy of non-Muslims and the ability to say Islamophobia is on the rise. Those who are embracing Muslims unintentionally help spread the word of Islam. As we are well into the “dawa” stage or the proselytizing of Islam, we are now entrenched into the hijra or migration of Muslims to non-Muslims countries to continue with the breaking down of our society. The last stage, known as Jihad, will bring violence and implementation of Islamic law, Sharia. For those who continue to embrace the onslaught of refugees and immigrants, know that once their population is higher in number, you too will face the fate of convert to Islam or die. Good luck. The West is not at war with Islam, but Islam is at war with the West. Click To read the entire Explanatory Memorandum On the General Strategic Goal for the Group In North America The beginning of this document is in Arabic, English follows. Evolution is akin to Revolution. Bad things happen so the good things come to light. We see new revivals new horizons as we progress. Were we to keep the status quo, we would never advance nor would we thrive as a nation. Printed this before,”Woe to the nation that receives her conquerors beating the drums. Woe to the nation that hates oppression in her sleep and accepts it in her awakening. Woe to a nation that raises her voice only behind a coffin and prides itself only in a cemetery. Woe to a nation that does not revolt until her very neck is placed on the scaffold.” UNDERSTAND THE Muslim PROBLEM. I Posted THIS A FEW MONTHS BACK: WATCH IT, LEARN FROM IT! https://www.youtube.com/watch?v=PFO1AtjoUoo This is how multiculturalism destroys nations! Do not believe what you hear on the MSM, MOSTLY FRABRICATION, This U Tube clip says it all and more. Folks you want to stay alive, be wise, understand what you are fighting. Bridgette Gabriel is also on the hit list to MURDER AND KILL along with Cathy Hinners.